Born in Las Vegas, the giant American goalkeeper moved to Europe at the age of sixteen to pursue a dream to become a professional keeper. His father was a keyboard player for the likes of Elvis Presley and Diana Ross, and his mother performed with Frank Sinatra and Sammy Davis Jnr. After moving to Europe, Ian played for Belgian sides RWD Molenbeek and FC Brugge, and played for the national side in the 1992 Barcelona Olympics. He returned to play for the Los Angeles Salsa in August 1993, but his dream of playing for an English Premier League side came true when he signed by West Ham United for £70,000 in March 1994, but he failed to make a first team appearance for the Hammers. Following his release in December 1995, he played for Peterborough United and Luton Town, before returning to America with New England Revolution. 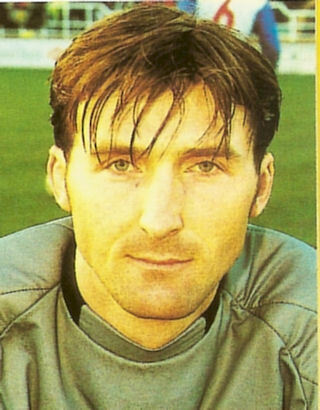 He joined Diamonds on 1 December 1998 to assist with a goalkeeping crisis when regular keeperss Mark Gayle and Mark Smith were unavailable due to injury. 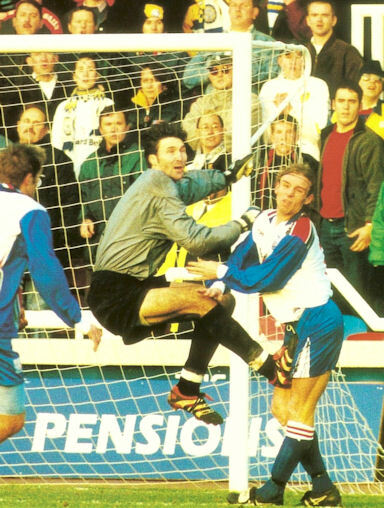 After playing in a League Cup tie at Farnborough on 22 December 1998, he made his league debut for the club in the Boxing Day game at Stevenage Borough, with the inclement weather resulting in a bout of flu that kept him out of the next game at home to Woking, so youth team keeper Steve Corry had to deputise. During his stay at Nene Park Feuer played in both FA Cup ties against Leeds United. Ian would have remained with Diamonds, but the fee requested by the MLS was too steep, and in February he had returned to the States briefly with Colorado Rapids. He did return to the UK to play for Cardiff City, West Ham United (finally making a premiership appearance), AFC Wimbledon, Derby County, Tranmere Rovers and Wolverhampton Wanderers. He went back to America again in October 2002, to take up a career in goalkeeper coaching. He has coached the US National team, and Los Angeles Galaxy . He currently is owner and director of the Premier Goalkeeping Academy in Southern Califormia.